Seasonal Diseases and Ayurveda – Ayurveda gives prior importance to prevention of diseases. Being a holistic system, Ayurveda defines health as a harmonic equilibrium of three humors or doshas. This equilibrium will be affected by seasonal changes. Every seasonal change causes increase or decrease of qualities such as lightness, heaviness, hotness, coldness, oiliness, dryness, softness, hardness, dynamicity, staticity etc. Structural and physiological units of the human body have the same properties. Thus seasonal changes will have a strong influence in our body and surroundings. Let us consider changes happening during the transition from summer to the rainy season. Fruits and vegetables collected during this period become comparatively sour in comparison to expected sweetness. Outbreaks of diseases predominant in Pitta principle like skin diseases, inflammatory conjunctivitis, heartburn and different types of fever happen during this season. From this, it becomes obvious that during such seasonal changes, an increase or decrease of qualities mentioned above will affect the harmonic equilibrium of three basic humors such as Vata, Pitta and Kapha. During the change from rainy season to early winter energy level goes up in all living beings. Properties like oiliness and tastes like sour, salt and sweetness also increase in nature. In winter all qualities of surroundings support Kapha principle. But since Kapha is a state of frozen state type it cannot result in diseases. In the next season ie, Spring, hot sunny days cause Kapha to melt and now it is capable of causing Kapha predominant diseases such as itching, sinusitis, loss of appetite, skin allergies, rhinorrhoea and many respiratory diseases. During the change from winter to summer, inherent energy decreases in all living beings. During this period, properties such as pungency, hotness, roughness increases. Tastes such as astringent, bitterness and pungent gain more power. In summer all qualities except heat support accumulation of Vata principle but since hotness is an opposite quality of this season, it cannot result in breaking of equilibrium of the three fundamental humors or doshas. But in the next season ie, Rainy season, coldness replaces the heat of summer resulting in aggravation of Vata. 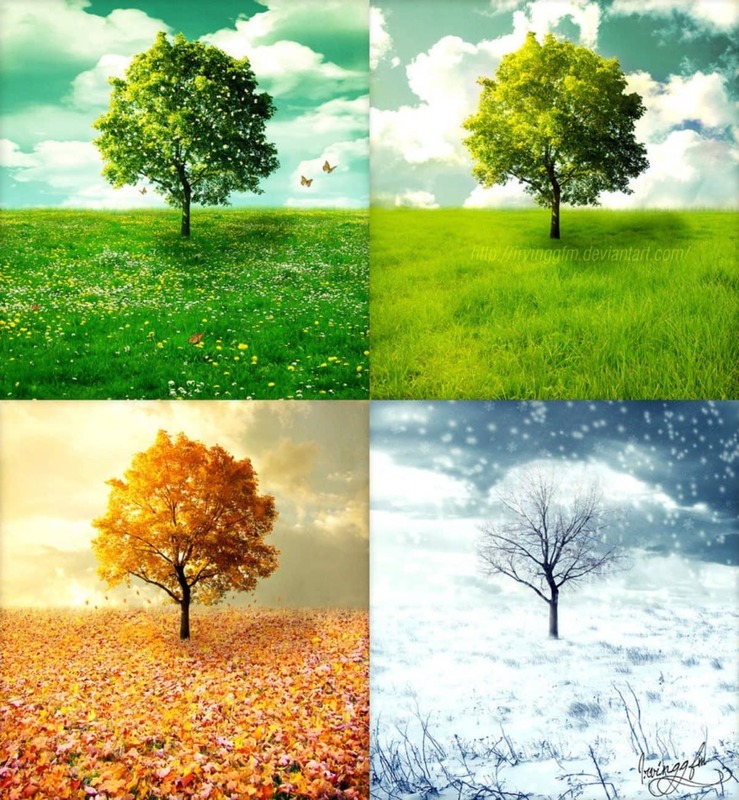 During the transitions of every season, the last week of the previous season and the first one week of the coming season together is considered the ‘Transitional Phase.’ This is a critical phase of seasonal diseases and a small trigger of unsuitable food, drink or activity will be sufficient enough to start a disease. Ayurveda strongly suggest body purification techniques to eliminate accumulated doshas or body humors .Diet modification for each season, specific drinks and exercises enable the body to prevent chances of any disease occuring during this seasonal change. Winter: Sweet and salty food items and drinks. External application of oil and exercises are also good for this season. Spring: Consume easy to digest and dry food items. Alcoholic beverages are not contraindicated in this period. Rainy Season: Easy to digest, warm food and hot water. Summer: Sweet, oily and easy to digest food and drinks. When someone fails in sensible modification of life style as per Ayurvedic advice they are sure to end up with illness. For information about how to maintain your health in different seasons, to assess your body constitution or a complete health check up please contact Ayurclinic. previousWhy Should I Consider Ayurveda?